Trans.eu is the first logistic platform integrated into Fleetboard nxtload. Fleetboard’s new freight metasearch engine will allow you to quickly search through different European freight exchange platforms. The product will be piloted with selected clients in different European countries. The market launch will be beginning of 2018. Empty trips and downtimes are the biggest problem for goods traffic. In practice trucks are stationary for around 50 percent of the time (when loading or unloading, at customs, in the workshop or during the driver’s rest times). Trucks are often only partially loaded or even empty whilst on the road. To remedy this situation, various freight exchanges and other platforms for placing freight, like Trans.eu have been developed. But the dispatcher’s task is to find the appropriate cargo in a large number of offers. The various offers on the individual platforms need to be compared with regard to profitability and feasability. Often, the appropriate cargo either cannot be found or has already been taken. The market needs an increase of the utilization of trucks and a more efficient freight placement. This can be achieved by purposefully linking and integrating digital solutions and applications in one place. This place is Fleetboard nxtload. The leaders of the integration project at Trans.eu Grzegorz Patynek, Open Platform Leader and Paweł Tronina, Western Europe Sales Director as well as Ulli Rix Manager Digital Solutions and Franziska Reinhardt, Product Owner Fleetboard nxtload from Digital Solutions for Daimler Fleetboard GmbH tell us about the new opportunities through the connection of both platforms. How has the cooperation with Trans.eu started and why did you choose Trans.eu? The idea for freight metasearch platform was born by MB Trucks Strategy team. Study indicated Trans.eu Platform among most relevant load boards in Europe. We contacted via Fleetboard Sales colleagues and visited Wrocław in Febuary – Ulli Rix, Manager Digital Solutions. 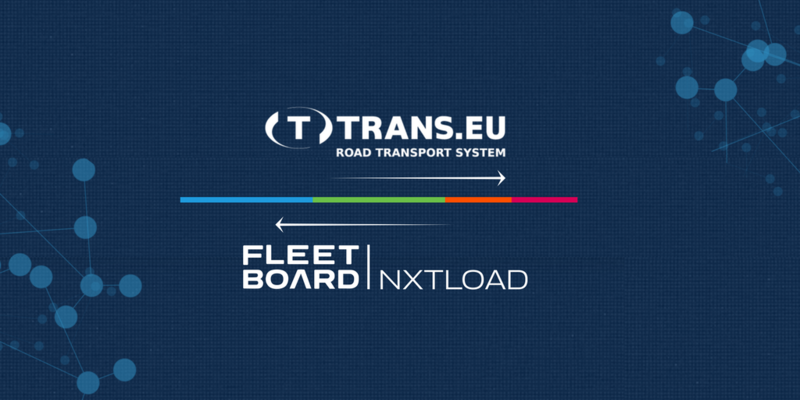 What are main benefits of the Trans.eu and Fleetboard nxtload integration? to reduce empty runs, and consequently reduce CO2 emissions. Fleetboard nxtload is available online, easy to use and allows you to interact with multiple contractors at a time. The biggest advantage is that all offers are provided in one tool and are integrated on just one screen – Franziska Reinhardt, Product Owner Fleetboard nxtload. Fleetboard is the first and only metasearch engine for freight. It’s an open system with many potential partners & possible customers. As well as strong technical partners with Microsoft and Here. We really enjoy the collaboration with the Trans.eu colleagues. Their expertise and experience with logistics in Eastern Europe, state-of-the-art software development and big database for freight helps Fleetboard nxtload continuous development – Ulli Rix, Manager Digital Solutions. Fleetboard nxtload works like popular metasearch engines such as e.g. Trivago. The platform aggregates and displays on a single screen all search filters and offers from Europe’s most relevant logistic platforms – Ulli Rix, Manager Digital Solutions. Who are the customers of Fleetboard nxtload? The Fleetboard nxtload platform was created for all participants in the transport process. The main users are carriers that search for available load space. In addition the tool can also be used by shipping or freight forwarding companies and drivers in the future, in combination with other Fleetboard products – Franziska Reinhardt, Product Owner Fleetboard nxtload. The freight metasearch engine is our first step. We continue our digital journey with Trans.eu and our other partners like Teleroute – Ulli Rix, Manager Digital Solutions. At the beginning of June, Daimler Fleetboard GmbH, Trans.eu and Teleroute will meet for workshops to plan the next steps. In the long run, additional features will be available, such as searching specific locations along a given route. Truck drivers will be integrated into the system using mobile cargo and route planning tools – Grzegorz Patynek, Open Platform Leader. Fleetboard nxtload is Fleetboard’s first product built on the Microsoft Cloud Azure platform. In collaboration with here Fleetboard has measured the capacity utilization of individual fleets throughout Europe. This data served as an impulse to create the freight metasearch engine Fleetboard nxtload. The platform has been developed within five months – Franziska Reinhardt, Product Owner Fleetboard nxtload. New features will be developed continuously. We will keep you updated on the progress. Higher rates, lower transport costs?